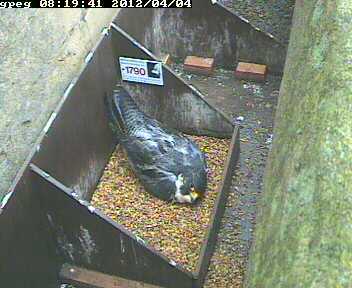 We have had 25mm of rain over the past eighteen hours and our peregrine female can't shed all that! She won't mind being soggy as long as the eggs are warm and dry. This is where an experienced bird like ours shows her skills as a mother. The tray is specially designed to shed excess rain water through slots in the front. It is possible that she has laid a fourth egg but we shan't know until the rain stops and she moves around. Good to see our webcam watchers in Canada and the Netherlands have been watching this week.